First Coptic Catholic church in Australia blessed and consecrated in Western Sydney. The blessing and consecration of St Mark's Coptic Catholic Church in Prospect. Image: Mary Brazell/Diocese of Parramatta. 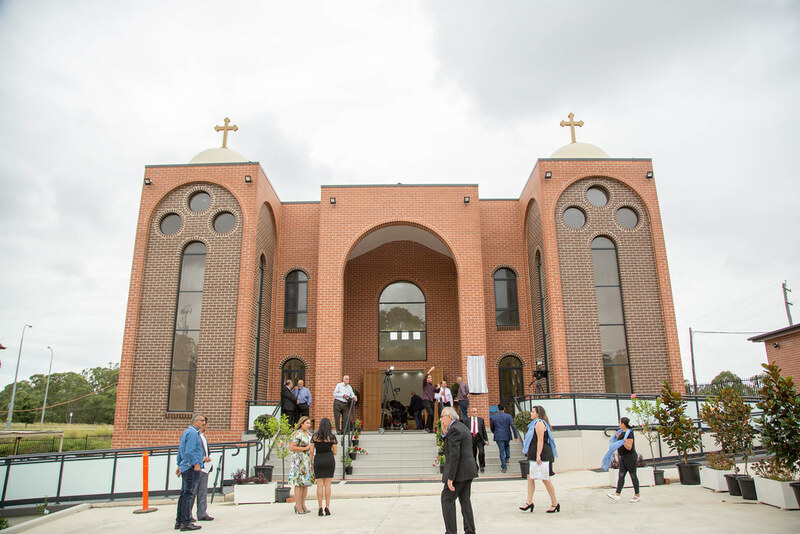 The Coptic Catholic community of Australia have celebrated the long-awaited opening and blessing of St Mark’s Coptic Catholic Church in Western Sydney on Saturday, 16 March 2019. The church, located in Prospect and constructed with the support of the Diocese of Parramatta, is the only Coptic Catholic church in the Australia. His Beatitude Ibrahim Isaac Sedrak, the Patriarch of the Coptic Catholic Church of Alexandria, Egypt, was the main celebrant in the blessing and consecration of the church, alongside Most Rev Vincent Long OFM Conv, Bishop of Parramatta. View images from the St Mark’s Coptic Catholic Church consecration ceremony here. Concelebrating were several bishops from the Eastern Christian churches, priests, and representatives of the Diocese of Parramatta including Very Rev Peter G Williams, Vicar General and Moderator of the Curia, Reverend Monsignor Ron Macfarlane, Chancellor for the Diocese of Parramatta, and Fr Andrew Fornal OP from St Joseph’s Parish, Kingswood. The Consul-General of Egypt Mr Yasser Abed and his wife Mrs Heba Hassan Salem, and local politicians were also in attendance. The consecration ceremony included readings, prayers and songs in both Arabic and English. During the consecration, Patriarch Ibrahim and Bishop Vincent blessed the four corners of the church and the altar with water and oil whilst chanting prayers. His Beatitude Ibrahim Isaac Sedrak, the Patriarch of the Coptic Catholic Church of Alexandria, Egypt, blesses St Mark’s Coptic Catholic Church in Prospect. Image: Mary Brazell/Diocese of Parramatta. In his thank you speech, Bishop Vincent acknowledged the importance of the dedication of the church to the Coptic Catholic community, not just in Western Sydney, but in Australia. “This distinction is a source of great pride and joy, not only for the people of this community but also for the Catholic Church in Australia and especially in this Diocese of Parramatta, in which this church is situated. “The church is not just a building, a physical structure. Though we are extremely proud to mark this milestone, this completion of a magnificent church building, we are also cognisant that church is first and foremost a presence – a presence of God and the power of God healing, nurturing, uplifting. “I can assure you, Your Beatitude, that the Diocese of Parramatta will continue to support and to give every assistance possible so that this community continues to grow and develop and become an icon of hope and faith. Bishop Vincent Long OFM Conv during the blessing and consecration of St Mark’s Coptic Catholic Church in Prospect. Image: Mary Brazell/Diocese of Parramatta. Fr Andraws Farag, parish priest of St Mark’s Coptic Catholic Church, said he was deeply honoured at the number of attendees for the consecration and gave his thanks to the political representatives in attendance, all those who helped in the construction of the church, as well as the former priests of the community. “I’d like to remind you – you are the church. You are the essence of Christ. Jesus Christ came to make human beings come and participate and be enlightened. “The church isn’t just a building. The church is you and us – your love and charity and your respect. “As much as Christ was light to this world, may you also be light and servers for this humanity,” Fr Andrawes said. His Beatitude, Patriarch Ibrahim, also gave his thanks to the community and those in attendance, saying the ceremony was beautiful. His Beatitude Ibrahim Isaac Sedrak, the Patriarch of the Coptic Catholic Church of Alexandria, Egypt, during the blessing and consecration of St Mark’s Coptic Catholic Church in Prospect. Image: Mary Brazell/Diocese of Parramatta. “There is a particular part of the reading that I want to draw your attention to. It was the part where the Lord speaks and says that we have chosen a particular place for Him where His heart and His Eyes will be honoured for the rest of eternity. “When we attend church, when we go on our Sundays, it isn’t something we just do because we must or we have to. We go there because we appreciate the leader, the real presence of Christ, God Himself. “We come and we get filled with love by God. We carry this love forward, outside of the church afterwards, to all those who we meet throughout our lives. “I take this chance and say that this church is not necessarily just for the Coptic Catholic community. Whoever has participated, whoever has assisted in bringing us to this day, all of those, regardless of their faith, their creed, are great people who have built this place and helped us to be here today. “I’d like to add that regardless of how old or young, how much you’ve worked – very little or too much – every person who participated in the building of this church has done a magnificent job. Thank you,” Patriarch Ibrahim said. Following the ceremony, dinner was held in the hall underneath the church, during which, the Patriarch cut a cake in the shape of the church. His Beatitude Ibrahim Isaac Sedrak (centre), the Patriarch of the Coptic Catholic Church of Alexandria, Egypt, cuts a cake following the blessing and consecration of St Mark’s Coptic Catholic Church in Prospect. Image: Mary Brazell/Diocese of Parramatta. Parishioners Juliette Dimian and Heba Missak said that it was a great honour to have Patriarch Ibrahim attend the blessing of the church. “We wish for everybody to keep praying for us, as we still need your prayers,” Juliette said. View images from the St Mark’s Coptic Catholic Church consecration ceremony here or below.